Daily Life in Traditional China: The Tang Dynasty by Charles Benn is an excellent resource as well as very entertaining reading. Charles Benn's writing style is very easy and accessible and makes for a really enjoyable experience. I think it is rare when one finds a straight history book (not a historical novel) which is so gripping one cannot put it down; Charle's Benn's book is one of these rare finds. Unlike Europe, where animal fats were the chief constituents of candles, the substance for candles in medieval China was usually an oil derived from the berry of a plant that was mixed with beeswax. Patricians might have aromatic candles that had various fragrances mixed into the wax, and filled their bedrooms with marvelous scents all night. They might also have elegant holders for them. A prince of the early eighth century had lads carved from wood and clothed in green robes that held candles in their hands. He placed the figures around his banquet mats whenever he dined with other princes and nobles (91). Women and men perfumed themselves. Palace ladies applied scents so lavishly that when they went out on an excursion, the redolence of their cortege permeated the air for miles. During the eighth century a courtesan in Changan was so skilled in applying scents to her body that her fragrance lured bees and butterflies, which followed her wherever she went (113). The image of the woman walking with bees and butterflies around her is almost magical but I laughed out loud at the palace ladies. When I lived in China I used to go to a cafe where heavily perfumed women would come in all the time with so much scent on, it overpowered the all-pervasive scent of some of the strongest tea I have ever known. When I read about these palace ladies all I could picture were the ladies who came to that cafe and those I encounter frequently now, especially when I visit a Starbucks, in America. Daily Life in Traditional China: The Tang Dynasty is also full of surprises. 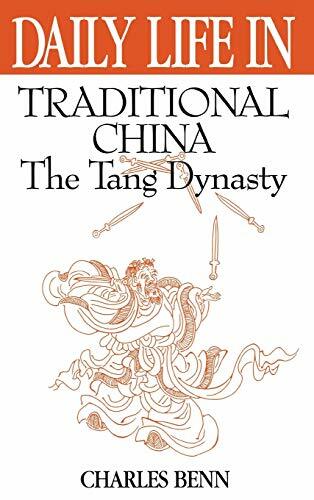 The Tang Dynasty is my personal favorite period of Chinese history but I did not know about some of the festivals Benn discusses or what they meant to the people. I was also unaware of just how much the belief in ghosts affected people's everyday life and decision making. Whether you are looking for a book to learn more about China or just want a very enjoyable reading experience, you should definitely pick up Daily Life in Traditional China. Benn, Charles. "Daily Life in Traditional China: The Tang Dynasty." Ancient History Encyclopedia. Last modified April 05, 2016. https://www.ancient.eu/review/122/. Benn, Charles. "Daily Life in Traditional China: The Tang Dynasty." Ancient History Encyclopedia. Ancient History Encyclopedia, 05 Apr 2016. Web. 18 Apr 2019.